Nifty future turned to buy mode on last friday. Currently the support zone coming close to 6006 reverse your position to positional buy if the support breaks on the lower side. Bank Nifty February future contract turned to sell mode on 24th Feb 2014 and the resistance zone comes close to 10337 respectively reverse your position to positional buy if the resistance breaks on the upper side. 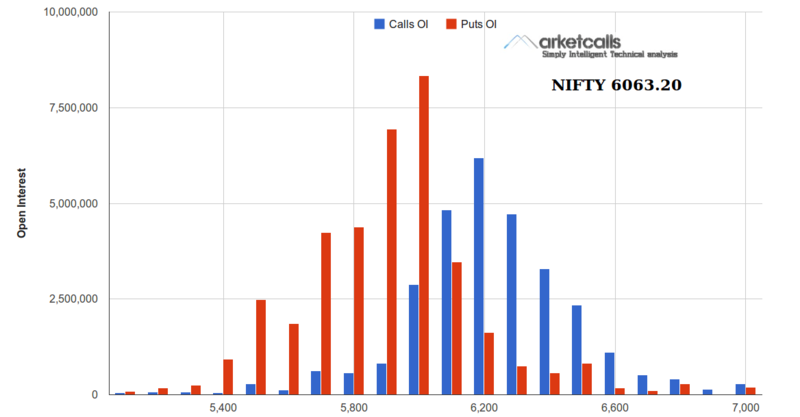 Nifty Open Interest chart shows still the 6000PE writers are strong and holding a higher amount of open interest among the other strike prices in nifty options shows their bullish view for the current expiry. Sir , do you have any free trial data provider Service ,if any, on Ami broker Software Setup? I am using GCI MT4 demo software. I have seen some of your post on this. Today (19th Feb 2014) I am seeing nifty value is updated abnormally (Observing the same behavior in USDINR for long time). Few days back tatasteel, tatamotors, SBIN are updated with some junk value, so the charts more than 30mins are not seen clearly. Did You or anybody observed the same? If so is there any solution for this ? @Kanniappan : Erroneous values are common in free demo accounts. And USDINR in GCI shows wrong values right from the beginnning. 1. How much it costs to have a real account ? 2. Won’t this erroneous values come in real account? It would be good if I get a confirmation from you or someone who is using it in real time. I would request you to share about bollinger bands and how to use it, if you know.